Turkish involvement in the Arab Spring and the Syrian civil war began at a time when Turkey’s impressive record of democratic progress and economic growth in the 2000s fueled remarkable optimism domestically and internationally about the country’s potentially democratizing influence in the greater Middle East, often discussed as “the Turkish model.” Against the background of the EU’s unwillingness to continue membership negotiations after 2005, the Arab Spring provided Turkey with an opportunity to reaffirm its newly-found democratic identity and to become the leading advocate of democracy across the Middle East. Some EU member states were skeptical toward Turkey’s membership, in part because of Islamophobic public opinion and differing legal and normative opinions about the role of religion in society, as evidenced by the attempts to ban circumcision, the Islamic headscarf, minarets, and ritual animal sacrifice in some EU member states. In contrast, the Arab Spring held the promise of new democratic polities in the Middle East that could more readily accommodate Islamic religious practices, which was a prospect that particularly appealed to the religious and conservative Justice and Development Party (AKP) government in Turkey. However, the United States and other major Western powers gradually backtracked from their support for democratization in Egypt and Syria, leaving Turkey alone in a dangerous neighborhood populated with non-democratic regional powers. The ambitious goal of removing authoritarian dictatorships in Egypt and Syria stretched far beyond Turkey’s ideational and material capabilities. Moreover, the Kurdish socialist Kurdistan Workers’ Party (PKK) declared “Revolutionary People’s War” against Turkey in July 2015, which led to the bloodiest episode of fighting between the PKK and the Turkish Armed Forces since the 1990s. Making matters worse, the Democratic Union Party (PYD) – the Syrian affiliate of the PKK – received support from, and came to be seen as the primary proxy of the US, which created a deep crisis in American-Turkish relations. Thus, internal threats far exceeded external threats, and immediate national security considerations took precedence over any other foreign policy objectives for Turkey. As a result, Turkey initiated a rapprochement with Russia with immediate repercussions for the Syrian conflict by the summer of 2016. Furthermore, the failed coup attempt of 15 July 2016 motivated the acceleration of Russian-Turkish rapprochement over Syria. Finally, Turkey launched the military operation Euphrates Shield in support of the Free Syria Army (FSA) in August 2016. Euphrates Shield distinguished Turkey and the FSA as the “third pole” in Syria with priorities that significantly differ from those of both Russia and the US. Turkey’s geopolitical identity has been in flux since the end of the Cold War. For the first time in more than three centuries, Russia and Turkey are not sharing a territorial border. With the dissolution of the Soviet Union and the emergence of Georgia as a buffer state between Russia and Turkey, the most significant and immediate national security threat for Turkey disappeared. This historical event had tremendous repercussions for Turkey’s geopolitical identity, which cannot be overstated. Turkey’s “western” orientation in foreign policy, from the British-Ottoman and the German-Ottoman alliances to the American-Turkish alliance, were all premised on balancing against and containing Russian or Soviet expansionism. Thus, with Russia having withdrawn north of the Caucasus, the primary geopolitical reason for Turkey’s western orientation also disappeared. Moreover, Turkey’s first membership application to the European Community (later renamed the EU) in 1987 was rejected two years later, whereas the EU extended official candidate status and eventually membership to many of the formerly communist Eastern European countries. The Arab Spring provided Turkey with an opportunity to become the leading advocate of democracy across the Middle East. It was under these circumstances that Samuel Huntington suggested in his seminal article that, “having rejected Mecca, and then being rejected by Brussels, where does Turkey look? Tashkent may be the answer.” Indeed, adopting an ambitious pan-Turkic discourse, best summarized in the popular slogan of the early 1990s, “Turkish world from the Adriatic Sea to the Great Wall of China,” Turkey challenged – but failed to compete against – Russia in Central Asia and in the Caucasus. The military coup against Azerbaijan’s pro-Turkish president Ebulfez Elcibey in 1993 was the most spectacular symptom of Russia’s preeminent influence over post-Soviet Turkic republics. This is particularly remarkable since Azerbaijan was, and still is, the post-Soviet Turkic republic that is economically, ethno-culturally, geographically, and linguistically closest to Turkey. As the competition over the Caucasus and Central Asia demonstrates, there have been enduring disagreements between Russia and Turkey over spheres of influence, but no direct challenge to each other’s territorial integrity anymore, unlike the previous three centuries. For example, although Moscow was the first destination PKK leader Abdullah Öcalan fled to after being forced out of Syria in 1998, Russia refused to give political asylum to Öcalan and forced him out of Russia, thus signaling respect for Turkey’s territorial integrity. The relative decline of the Russian threat and the rise of other threats in the Middle East, such as the US occupation of Iraq in 2003, drew Turkey closer to Russia. In terms of domestic determinants of geopolitical identity, Turkey’s democratization in the 2000s, the hallmark of which has been the emancipation of religious conservatives and ethnic minorities (i.e. Arabs, Kurds, Zazas, etc.) from second-class citizenship, initially brought Turkey closer to the EU. In fact, the EU began membership negotiations with Turkey in 2005 following the reforms the latter undertook in the early 2000s. Thus, it seemed possible, if not likely, that Turkey’s geopolitical identity would evolve in a pro-European direction, culminating in EU membership. There were at least three interrelated reasons that blocked the evolution of Turkey’s geopolitical identity in a pro-European direction. First, and perhaps most important in the short and medium-term, has been the seemingly insurmountable opposition of key EU member states such as Austria and France of Turkey’s EU membership. This unwillingness to accept Turkey into the EU is not limited to Austria and France, and rather common in many EU member states. Second, and much underemphasized is the opposite phenomenon; that is, the apparent incompatibility between the supranational families that Turkey considers itself as being part of, such as the Islamic and the Turkic world, and the supranational family that the EU represents. Third, European institutions, including not just political but also legal authorities, gave discouragingly negative signals regarding the accommodation of Islamic religious practices in public. For example, in the famous case of Leyla Şahin (2004-2005), the European Court of Human Rights (ECHR) upheld Turkey’s headscarf ban. This was a major disappointment for the AKP, which was expecting European institutions such as the ECHR to play an emancipatory role for the religious conservatives in Turkey. Thus, by the mid-2000s, Turkey’s pro-European orientation faced major domestic and international challenges and both agentic and structural obstacles. In 2007, Turkey faced a crisis over presidential elections, followed by another political and constitutional crisis over the AKP’s attempt to remove the headscarf ban in 2008. Both crises were resolved in the AKP’s favor, followed by the constitutional referendum of September 2010, which allowed the parliament and the president to appoint the highest-ranking members of the judiciary and the military. Thus, by the end of 2010, just as the Arab Spring was beginning, Turkey was removing the segregationist measures against religious conservatives and ethnic minorities, which were major milestones in its democratization and yet, it was rebuffed in its pursuit of EU membership. Turkey’s vocal support for democratization in the context of the Arab Spring brought the geopolitical identity-related contradictions between Turkish and Western preferences to the fore. The Arab Spring provided an opportunity for Turkey to reassert itself as a recently democratized Muslim-majority polity with ambitions to exert a democratizing influence across the Middle East. This was particularly important because of the paradox outlined in the previous section: Turkey’s AKP government self-identified as an actor of democratization in Turkey, and yet some EU member states had suspicions about Turkey’s democratic credentials, not the least because of their ambivalence and uneasiness about the accommodation of Islamic religious practices as part of a democratic polity. In short, there were both empirical and theoretical disagreements between some EU member states and Turkey about the meaning of democracy and democratization as they relate to religious freedom of the mainstream (Sunni) Muslims in the Middle East. This disagreement explains why Turkey gradually became the most vocal advocate of the revolutions against authoritarian leaders as part of the Arab Spring, whereas many EU member states maintained an ambivalent position, sometimes even openly supporting military dictatorships. European institutions gave discouragingly negative signals regarding the accommodation of Islamic religious practices in public. The revolutionary uprisings that swept the Arab Middle East in the 2010s are sometimes compared to the revolutionary uprisings of 1848 in Europe. Following the 1848 metaphor, Turkey emerged as the most vocal – albeit unsuccessful – supporter of the revolutionary forces during the Arab Spring, whereas Iran and Russia gradually emerged as the most decisive and successful supporters of the counter-revolution. In the beginning, key members of NATO such as the US, France, and Turkey all supported the revolutionary uprisings against military dictatorships in the Middle East, including most importantly in Egypt and Syria. However, all of them except Turkey gradually withdrew their support from movements challenging authoritarian regimes, such as the Muslim Brotherhood in Egypt and the Free Syria Army (FSA) in Syria. The key turning point, which saw the counter-revolutionary reaction surpass the revolutionary fervor of the Arab Spring, was the military coup that overthrew the democratically elected president of Egypt, Mohammed Morsi, in July 2013. The reactions to the coup in Egypt provided a litmus test of attitudes toward democracy in the Middle East. Turkey remained alone among Western powers in supporting Morsi and the Muslim Brotherhood in Egypt. Turkey was also opposed by Saudi Arabia, which provided billions of dollars to the Egyptian military dictatorship after the coup. Both Iran and Saudi Arabia had a vested interest in derailing the anti-authoritarian uprisings away from a struggle for democratization and toward a religious sectarian war. Thus, not just Saudi Arabia but also Iran (as can be observed in Iran’s intervention in Syria) employed “sectarianism as counter-revolution,” a phrase that Madawi Al-Rasheed used to describe the Saudi response to the Arab Spring. Since almost all Middle Eastern polities are anti-democratic, there was no regional power with which Turkey could ally itself in support of democratization in the region. Egypt would be the most likely and most powerful such ally if it remained an electoral democracy, but that window of opportunity to form an “axis of democratization” between Egypt and Turkey closed by July 2013. The counter-revolutionary powers such as Russia and Iran proved to be much more determined to suppress anti-authoritarian uprisings and to secure the survival of their clients. By 2015, both Russia and Iran had already entered Syria with their own armies – a time when no outside power supporting the anti-Assad rebels had troops in Syria. Notably, and somewhat surprisingly, neither France nor the US intervened militarily in Syria. Moreover, both France and the US sought good relations with President Abdel Fattah el-Sisi’s dictatorship in Egypt. France even sold to Egypt the two famous Mistral ships, which were originally built for sale to Russia. Without much support from the Western powers for its advocacy of democratization in Egypt and Syria, Turkey scaled down its ambitious goal of regime change in both countries. In short, geopolitical realities eventually trumped what was arguably Ankara’s democratic idealism, thus forcing Turkey to revise its goals in Egypt and Syria. The coup attempt in Turkey on 15 July 2016 could be interpreted as the highpoint of the counter-revolutionary wave against democratization in the Middle East. However, unlike the coup in Egypt three years earlier, the coup attempt in Turkey failed, and thus went against the authoritarian trend. The coup plotters’ affiliation with Fethullah Gülen, the leader of a messianic religious cult residing in the US since 1999, and the unwillingness of the US to extradite Gülen or any of the Gülenist officers and leaders who fled to the US, also motivated Turkey’s rapprochement with Russia. The coup attempt in Turkey on 15 July 2016 could be interpreted as the highpoint of the counterrevolutionary wave against democratization in the Middle East. In revising its policy toward Syria, Turkey sought rapprochement with Russia as early as Spring 2016. Turkey’s earlier democratic idealism came to be associated with Ahmet Davutoğlu, who served as the foreign policy advisor to the Prime Minister (2003-2009), as the Foreign Minister (2009-2014), and eventually as the Prime Minister (2014-2016) in the AKP governments. Thus, his resignation in May 2016 was also interpreted by some as a symptom of a larger shift in Turkey’s foreign policy. In June 2016, Turkey took steps to normalize its relations with Russia and Israel, two countries with which relations had been sour since the shooting down of the Russian Sukhoi Su-24 aircraft in November 2015 and the Gaza flotilla raid in May 2010, respectively. Despite disagreements over the conflicts in Georgia, Ukraine, and Syria, Turkey and Russia cooperated in economic and strategic areas, including the building of Turkey’s first nuclear power plant. The launching of the Operation Euphrates Shield (OES) against ISIL was the most significant indicator of Turkey’s new policy vis-à-vis Syria. Euphrates Shield began only one month after the failed coup attempt and the dismissal of approximately 43 percent of all generals and admirals in the Turkish military, which can be considered as a sign of strength despite the coup. More importantly from a geopolitical point of view, Turkey had frequent consultations with Russia prior to launching OES, thus giving the impression that the operation was launched with the implicit approval of Russia. Also significant is the fact that the US’ support for OES against ISIL has been minimal. Thus, Turkey entered Syria in support of the FSA as a “third force” that is separate from the Kurdish socialist PYD supported by the US, and the Assad regime that is supported by Russia and Iran. Unlike regime change in Damascus, which was an ambitious and idealistic goal, the OES is a very limited operation that is proportionate to Turkey’s material capabilities. This operation is also consistent with Turkey’s insistence on establishing safe zones in northern Syria where civilians escaping Assad’s regime, the PYD, and ISIL can take shelter. There is a major gap between Turkey’s self-identification as a democratic polity, and the depictions of Turkey in the Western media. At present, Turkey appears as a self-identified democratic polity that is not necessarily accepted as such by the Western democracies. Turkey did not receive the support of its Western allies in facing its two most important and immediate internal security threats, namely, the PKK’s offensive starting in July 2015 and the Gülenist coup attempt in July 2016. Making matters worse, Western powers such as Germany and the US were perceived as sheltering or even supporting the PKK and the Gülenists. Both developments motivated a rapid Russian-Turkish rapprochement in 2016. The launching of the Operation Euphrates Shield against ISIL was the most significant indicator of Turkey’s new policy vis-à-vis Syria. Does this rapprochement amount to Turkey adopting a “pro-Russian Eurasianist” geopolitical identity, just as a small but powerful group of intellectuals, politicians, and military officers have been advocating for almost two decades? The publicly available evidence does not support such a grandiose inference. Russian-Turkish rapprochement appears to be tactical in nature, where the two states continue to support different proxies in Syria and have different opinions regarding major geopolitical conflicts in Turkey’s immediate neighborhood, including the status of Crimea, Kosovo, and Nagorno-Karabakh, among other disputed territories. One may argue that the changing balance of military threats with the dissolution of the Soviet Union (i.e. the rise of new threats such as the PKK-PYD offensive and the Gülenists) explains Russian-Turkish rapprochement, a neorealist interpretation; or alternatively, that this rapprochement is driven primarily by growing trade and economic linkages, a liberal interpretation of international cooperation. There are at least two major questions that remain to be solved in Turkish policy toward Syria. First, what will be the territorial extent of Operation Euphrates Shield? Will it be the town of Al-Bab as often speculated? Relatedly, what will be the status of the large territory in northwestern Syria that is the stronghold of the FSA, centered on the city of Idlib? Secondly, what will be the status of millions of Syrian refugees in Turkey and elsewhere? We can assume that the overwhelming majority of these refugees are the opponents of the Syrian regime. Refugees’ “right of return” is an ethical imperative, not only in Syria, but also in the Serbian-controlled half of Bosnia-Herzegovina and the Armenian-occupied Nagorno-Karabakh in Azerbaijan, where hundreds of thousands of Bosniaks and approximately one million Azerbaijanis, respectively, were forced out of their homes more than two decades ago, and were denied the right of return. Not allowing the right of return would be tantamount to rewarding the political authorities who undertook a demographic engineering project by forcing their opponents out of the territories under their control. Bosniaks who would return to the Serbian-controlled half of Bosnia Herzegovina, Azerbaijanis who would return to the Armenian-controlled Nagorno-Karabakh, and Syrian refugees who would return to parts of Syria controlled by the Assad regime, are likely to counteract the consolidation of ethnic, sectarian, or ideological authoritarianism in their respective territories. Does this Turkey-Russia rapprochement amount to the former adopting a ‘pro-Russian Eurasianist’ geopolitical identity? Turkey became the largest recipient of refugees in the world with approximately three million Syrian refugees, which is a development that is supportive of Turkey’s transformation in a multiculturalist direction. Moreover, the Turkish public’s self-identification as a democratic polity with a belief in the right of the majority to govern their country through regular elections, is likely to sustain popular support and sympathy for the anti-authoritarian uprisings against military dictatorships in countries such as Egypt and Syria. Thus, Turkey’s geopolitical rapprochement with Egypt, Iran, or Russia is not likely to reverse the popular antipathy against the military dictatorships of el-Sisi and Assad in Egypt and Syria, respectively. This is even more the case in the aftermath of the failed coup attempt of July 2016, where hundreds of civilians died fighting the coup plotters, and thus are popularly revered as the “martyrs of democracy” in Turkey. The failure of the military coup reinforced Turkey’s self-identification as a beacon of democracy, however isolated and lonely, in a region populated by military dictatorships that are supported by outside powers. Şener Aktürk, “Turkey’s Civil Rights Movement and the Reactionary Coup: Segregation, Emancipation, and the Western Reaction,” Insight Turkey, Vol. 18, No. 3 (2016), pp. 141-167. Emel Parlar Dal and Emre Erşen, “Reassessing the “Turkish Model” in the Post-Cold War Era: A Role Theory Perspective,” Turkish Studies, Vol. 15, No. 2 (2014), pp. 258-282. The only brief exception would be the several years after the Bolshevik Revolution, when Armenia, Azerbaijan, and Georgia were independent (1918-1921). By 1921, the Bolshevik regime took control of all three Caucasian republics. Samuel P. Huntington, “The Clash of Civilizations?” Foreign Affairs, Vol. 72, No. 3 (1993), p.42. Şener Aktürk, “Turkish–Russian Relations after the Cold War (1992–2002),” Turkish Studies, Vol. 7, No. 3 (2006), pp. 337-364. Sener Aktürk, “Incompatible visions of supra-nationalism: National identity in Turkey and the European Union,” European Journal of Sociology, Vol. 48, No. 2 (2007), pp. 347-372. “The AKP government in Turkey has become a major supporter of political change and democratization in the era of the Arab revolutions,” Ziya Öniş, “Turkey and the Arab Revolutions: Boundaries of Regional Power Influence in a Turbulent Middle East.” Mediterranean Politics, Vol. 19, No.2 (2014), p. 203. Kurt Weyland, “The Arab Spring: Why the Surprising Similarities with the Revolutionary Wave of 1848?” Perspectives on Politics, Vol. 10, No.4 (2012), pp. 917-934. Another comparison would be the anticommunist revolutions of 1989 in Eastern Europe. Madawi Al-Rasheed, “Sectarianism as Counter-Revolution: Saudi Responses to the Arab Spring,” Studies in Ethnicity and Nationalism, Vol. 11, No. 3 (2011), pp. 513-526. Nonetheless, Turkey intensified its interactions with Egypt during its brief democratic opening between 2011 and 2013. Thus, as Öniş has argued, Arab Spring was “an important test case for establishing the boundaries of regional power influence.” Öniş, “Turkey and the Arab Revolutions,” p. 203. Sener Aktürk, “Toward a Turkish-Russian Axis? Conflicts in Georgia, Syria, and Ukraine, and Cooperation over Nuclear Energy,” Insight Turkey, Vol. 16, No. 4 (2014), pp. 13-22. Şener Aktürk. “The Fourth Style of Politics: Eurasianism as a Pro-Russian Rethinking of Turkey's Geopolitical Identity,” Turkish Studies, Vol. 16, No. 1 (2015), pp. 54-79. Ziya Öniş and Şuhnaz Yılmaz, “Turkey and Russia in a shifting global order: cooperation, conflict and asymmetric interdependence in a turbulent region,” Third World Quarterly, Vol. 37, No.1 (2016), pp. 71-95. Ahmet İçduygu and Dtoğuş Şimşek, “Syrian Refugees in Turkey: Towards Integration Policies.” Turkish Policy Quarterly, Vol. 15, No.3 (2016), pp. 59-69; Sener Akturk, “Post-imperial democracies and new projects of nationhood in Eurasia: transforming the nation through migration in Russia and Turkey,” Journal of Ethnic and Migration Studies (2016), pp.1-20. 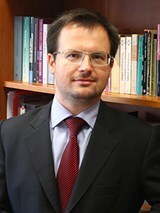 Dr. Şener Aktürk is an Associate Professor in the Department of International Relations at Koç University, Istanbul.